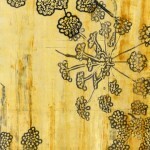 Woodblock printing is one of the earliest and simplest of the printmaking techniques. It is also one of the most enduring, having been in constant use for centuries. You draw the image for a woodblock print on the plank or long grained side of the board. The areas of the image that will not be printing are removed by cutting away the wood. Ink is applied to the raised areas and the image is printed in reverse on paper or cloth either by hand or with a press. Wood is so familiar and it is easy for us to not give it much thought. Most of the woodblocks used today by printmakers are in laminate form – wood layers that have been glued together to produce a stable surface making it less prone to warping than a solid plank of wood. Plywood is ubiquitous. Our homes are potentially full of it. What do you know about the use of plywood and fiberboard used in your kitchen cabinets, furniture and subflooring to name just a few domestic uses? Basswood – A favorite wood for of woodcut artists. It has few knots and does not warp as easily as pine and it is relatively easy to cut. Plywood – made by gluing together thin layers of wood, called plies. The greater number of plies, the stronger and more expensive the plywood. Birch plywood – used quite frequently because of its strong surface veneer that will not dent or mark easily while cutting it. 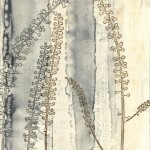 Shina plywood – a favorite for artists working in the Japanese printmaking style. It has a basswood face and a basswood or mahogany core. Other woods (plywoods and Fiberboard) are made up of layers of wood or wood dust held together with adhesives. The adhesives may contain chemicals that are hazardous when inhaled or absorbed through the skin. 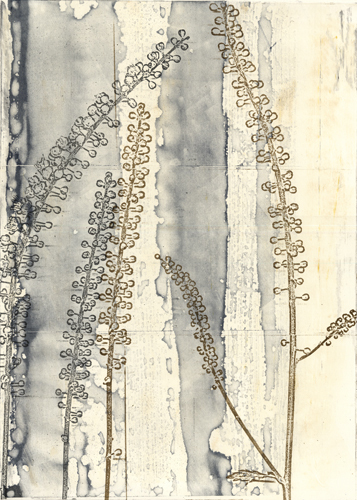 Judith Bowerman, Cimicifuga III, polyester plate lithography and monotype on wood substrate. What makes one manufacturer’s plywood safer than another’s? The adhesives used in plywood have become a point of concern. Some manufacturers (Columbia Wood Products and McClain’s) have reduced or eliminated the use of formaldehyde in their adhesives. What are the short-term health effects of formaldehyde exposure? When formaldehyde is present in the air at levels exceeding 0.1 ppm, some individuals may experience adverse effects such as watery eyes; burning sensations in the eyes, nose, and throat; coughing; wheezing; nausea; and skin irritation. Some people are very sensitive to formaldehyde, whereas others have no reaction to the same level of exposure. Artist Beware, by Michael McCann, Page 426: Formaldehyde resin glue: Resorcinol-formaldehyde and urea-formaldehyde glues are highly toxic by eye contact and by inhalation, and moderately toxic by skin contact. The formaldehyde can cause skin and respiratory irritation and allergies, and is a known human carcinogen. The resin components may also cause irritation. Even when cured, any unreacted formaldehyde may cause skin irritation, and sanding may cause decomposition of the glue to release formaldehyde. Formaldehyde can be a problem when working with fiberboard and plywood. AVOID FORMALDEHYDE-RESIN GLUES BECAUSE OF CARCINOGENICITY OF FORMALDEHYDE. Artist Beware, by Michael McCann, Page 328: Relief printmaking: Woodcuts and Wood Engraving – … Hazards: some of the woods used – for example, boxwoods and some beeches – are moderately toxic skin irritants or can cause skin allergies. The dusts from many of these woods are moderately toxic if inhaled. See chapter seven, page 429, table 17-1, for full list of toxic woods. Birch: reaction – sensitizer, site: respiratory, potency – moderate probability, source – wood and dust, incidence – common. Amherst Woodworking, 30 Industrial Ave, Northampton carries Columbia Forest Products birch plywood. Shina Plywood: Email letter from McClain’s Printmaking Supplies: Here is the info we have on formaldehyde content in the Shina plywood glue: According to our supplier the glue used for the Shina has an average of 0.3 MG/L of formaldehyde, with a maximum of 0.4 MG/L. The supplier also said that most plywood on the US market uses glue with 5 MG/L of formaldehyde. 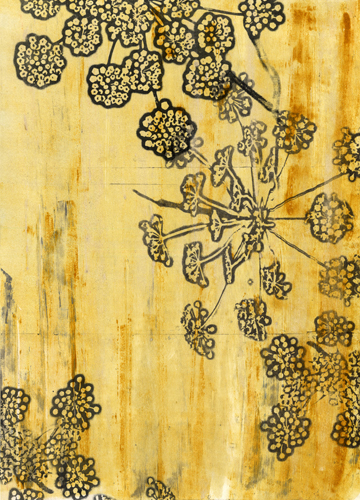 Judith Bowerman, Foeniculum Umbels III, polyester plate lithography and monotype on wood substrate. Low-Emission Interior Products: www.healthyhouseinstitute.com/hhip_782-Plywood “Realistically, the only way to obtain low-emission furniture-grade plywood product is to have it custom made. While feasible, this can add cost to a project—sometimes substantially. Some manufacturers will custom make small quantities (even 1-2 sheets) of a veneered product to your specifications. The production process involves using a low-emission base material and laminating any number of different veneers (such as oak, cherry, hickory, or even exotic imported woods) to the front and back surfaces with a variety of different glues (such as a PF glue or a polyvinyl-acetate glue). Woodcut is the most ancient form of printmaking. It began in Egypt and China as wooden stamps that made impressions into clay and wax to decorate textiles. Some scholars trace the woodcut’s beginning to Empress Shotoku of Japan, in eighth century she commissioned an edition of two Buddhist good luck poems printed from wood blocks. It was later in the 17th century that the Japanese developed it into an art form. Japanese printmakers continued to use water-base inks while Europeans starting experimenting with oil base inks. It was not until paper was produced in large quantities in France, Italy, and Germany in the 14th century that the art of the woodcut began to unfold. In southern Germany, woodcuts began as primitive religious figures. Their directness, simplicity of line, and economy of means made them very powerful. As the invention of printing from movable type became a reality in the mid-15th century, the woodcut began to appear in more highly developed forms as illustrations for religious books. By the late 15th century the great artists of the time, Durer and Hans Holbein in Germany, Lucas von Leyden in the Netherlands, and Titian in Italy were using this new medium with great eloquence. It was not until the revival of the woodcut as a sensitive, personal art form in the late 19th century, that it regained its place as a major expressive form. Gauguin, Van Gogh, Lautrec, Whistler, the German Expressionists and Edvard Munch greatly helped to renew interest in the woodcut as a serious contemporary art form. With this revival of the woodcut as a fine print medium came a new spontaneity and creative use of the material. Our homes are potentially full of it – kitchen cabinets, furniture and subflooring are just a few domestic uses. Plywood is not a 20th century invention – Archeologists have found traces of laminated wood in the tombs of the Egyptian pharaohs. A thousand years ago, the Chinese shaved wood and glued it together for use in furniture. The first patent for what could be called plywood was issued December 26, 1865. Cross-laminating layers of wood veneer actually improve upon the inherent structural advantages of wood by distributing along-the-grain strength of wood in both directions. The adhesives used in plywood have become a point of concern. Both urea formaldehyde and phenol formaldehyde are carcinogenic in very high concentrations. As a result, many manufacturers are turning to low formaldehyde-emitting glue systems, denoted by an “E” rating (“E0” possessing the lowest formaldehyde emissions). Plywood produced to “E0” has effectively zero formaldehyde emissions. Toale, Bernard. Basic Printmaking Techniques. Worcester, Massachusetts: Davis Publications, Inc., 1992. Walker, George. The Woodcut Artist’s Handbook, Techniques and Tools for Relief Printmaking, Firefly books LTD. 2010.